The old stories have a life of their own. Leaving Baikal, we discover the old Mongol myth that suggests the grave of Genghis Khan is on a lake Baikal island. His mother came from the local Buryat tribes who believed that they should be buried as close to the lake as possible. 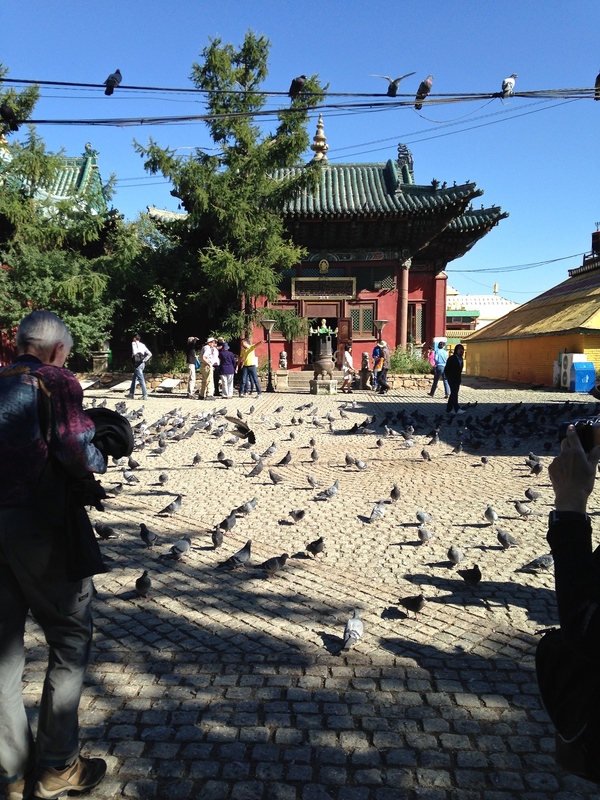 Before turning towards Mongolia however, the Golden Eagle makes a longer stop at Ulan Ude, a city whose name means the “Red(river) Ude”(while Ulan Baatar means “Red Warrior”). It was, like Vladivostok, closed to foreigners during Soviet times until 1991.Today it is “twinned” with Berkeley, California. Look on my works ye Mighty and despair ! Soon we leave the city for a trip back in to Russian tradition and a fascinating visit to an Old Believer community, exiled to Siberia centuries ago for refusing to accept reforms aligning the liturgy with that of the Greek Church. During the visit we have lunch, enjoy village songs and jokes, admire the colorful painted houses and their gardens. Soulful Russian poet Yesenin, once lover and husband of Isadora Duncan, came from an Old Believer peasant family. We hear about even more traditional Old Believer communities such as those in Estonia that still follow ancient prohibitions such as the one where men who die without a beard have to be buried in an unmarked grave or another about women who, unable to enter a church bareheaded, must have their scarves pinned under their chin for tying a knot is symbolic of the suicide of Judas by hanging. Otherwise the traditional icons are similar, the “onion domes” of churches still represent the flame of a candle, while the lower bar on the crucifix, at an angle to the cross, represents pointers signifying up to heaven, down to hell, a reminder of the choices made by the two thieves crucified on either side of Christ on Golgotha. Another window on the Russian soul. hear the lamentations of their women. 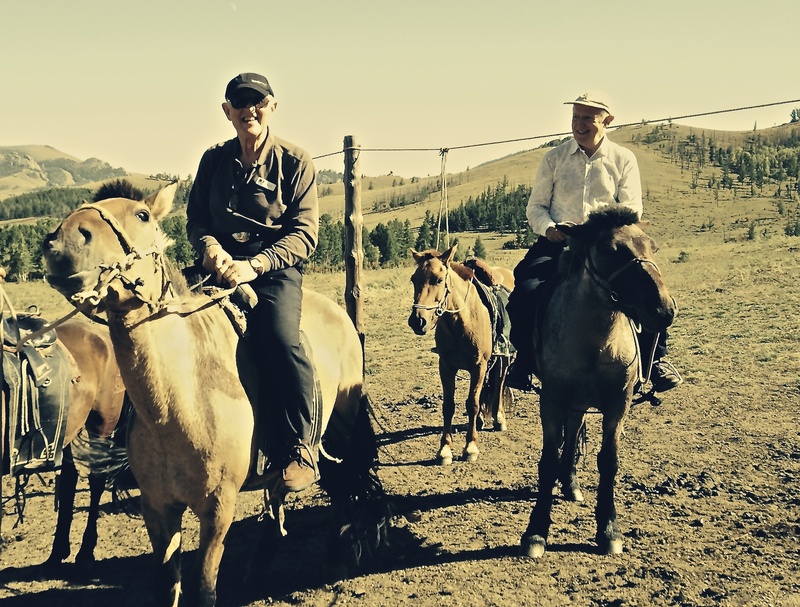 We find out later that Mongolians ride ponies as soon as they can walk, an ancient tradition. Genghis Khan would lead an army of 100,000 horsemen to found, in 25 years, the largest empire in the history of the world, six times larger than the one it took the Romans 400 years to establish. An interesting discussion followed, on how they managed to do it wether through superior organisation or the aid of magic plants.Those 13th century Mongol warriors fed Sea Buckthorn (see your local health food store !) to their little horses, to increase their strength and make their coats shine. In no time, their speed made the armoured knights of Europe obsolete. The warriors also ate this plant’s orange berries to give themselves strength for battle, and used them to treat their wounds. This gave them greater endurance and faster recovery than their foes. We were reminded that geneticists today are fascinated that 1 in 200 men carry the Y chromosome (that is some 16 million or 0.5% of the male population of the world) making them in direct line of descent from Genghis Khan, while his grandson Kublai Khan (and protector of Marco Polo) contributed by adding 30 virgins to his harem every year ! Maybe the aura of Mongolia is best conveyed in the words of the legendary Ferdynand Ossendowski in his Beasts, Men and Gods. Describing his escape from communist Siberia through Mongolia he feels that “Mongolia with her rude and terrible mountains, her limitless plains, covered with the widely strewn bones of the forefathers gave birth to Mystery. Her people frightened by the stormy passions of Nature, or lulled by her deathlike peace, feel her mystery”. Wow, get those passports ready ! 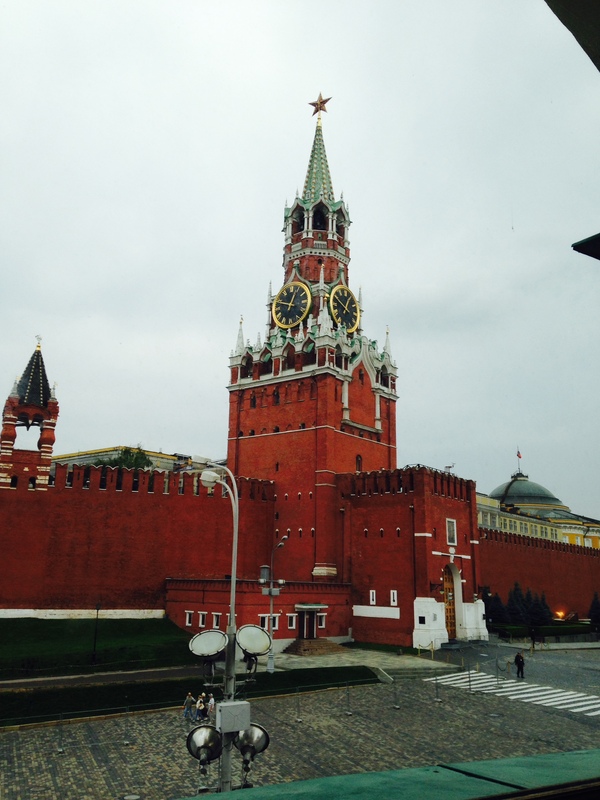 On the Golden Eagle across Siberia (Part II) – From Moscow out! We began with an assembly at the Royal Aurora Hotel in Moscow. The travelers had gathered from various parts of the world. Some had taken a comfortable river cruise from St.Petersburg, most had been met after arrival at Domododevo Airport. En route to the city we were greeted by numerous hoardings featuring a large Gerard Depardieu, a new Russian passport holder (and 13% taxpayer), advertising something forgettable. Others announced the release of some torrid film called “Sin City 2”. There are many new Orthodox churches with beautifully gilded domes, countered by 7 storey Munich-style glass walled motor car showrooms. Traffic lights on major roads have a 60 second numbered countdown for drivers. We pass branches of “Makdonalds” (several recently closed down in retaliation for sanctions, though officially on “health and hygiene” grounds). 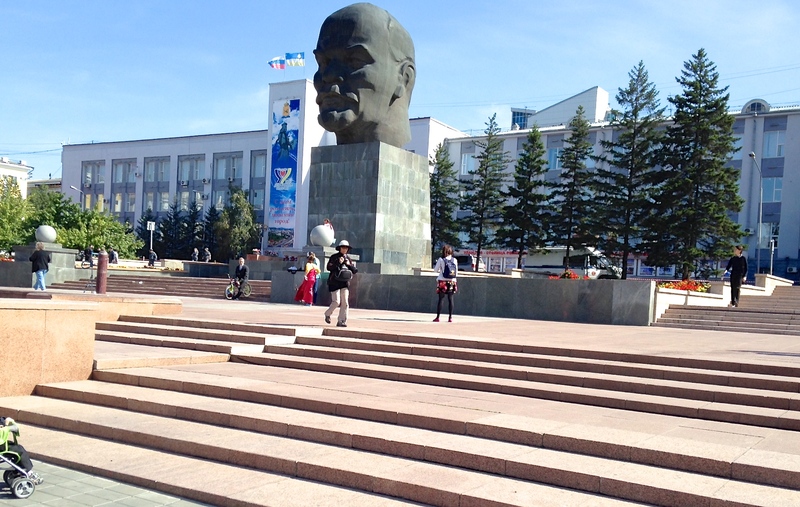 The Dostoyevsky monument stands out in front of the Russian State Library. Nearby, a flower-selling cabin is offering a 24 hour service. Unlike the old Soviet days, when even luxury hotels, like the huge Rossyia, were controlled by the floor ladies and it was advisable to bring your own toilet paper and rubber washbasin stoppers, our hotel was fully equipped (while the old Rossyia has been demolished to be replaced by some complex inevitably designed by the ubiquitous Norman Foster). Like all Marriott managed hotels, the Aurora included a drawer containing a Bible, a Book of Mormon and a company mission book, in which Bill Marriott assures us that “if you treat your employees well, they’ll take care of the customer”. There were magazines offering very complicated watches, and cocktails, also a large catalogue of jewelry by ultra refined Boucheron from Paris (who have a branch in the hotel building). The nearby GUM department store even contains an unofficial but very Apple Store-like retailer. The Golden Eagle Trans-Siberian Express has prepared drinks, dinner and briefing in the elegant Petrovsky Room. Our fellow participants have come from Montparnasse and Monceau, Ballerat and Peppermint Grove, Hawick and Clapham, Totness and Cardiff. Some others from Anchorage and Manhattan, New Forest, Toronto and even Taiwan. All inspired by the romance of this journey, a rich mix of stories and experience. We are introduced to our traveling on-board physician, Dr Judy, from the Cotswolds, and even our own Oxford Don, Professor Healey from St.Antony’s (so all aspects seem covered, taking note of Paul Theroux’s warning that travelers may not know where they are going, but tourists don’t know where they have been). Next morning Golden Eagle have arranged a privileged early entry to the Kremlin Armoury buildings. We walk past President Putin’s office on our way to the building that contains the most important exhibits, including the renowned Fabergé display. This includes a tiny Trans-Siberian train of five carriages, which used to be rolled up inside an egg. It can stand freely, while the little mechanical engine can pull the carriages two whole inches. On the way to the Kazansky station, we pass near Lubianka square. The ex-KGB building is being renovated. The organisation is now known as the Federal Security Bureau. There is talk of the Feliks Dzerzhinsky statue, removed in 1991, being returned. This founder of the Cheka, set up to counter so-called internal threats, ordered the execution of thousands of political opponents without trial. Now his bust is already back at the Moscow police headquarters. In a 2013 poll, some 45% of Russians would approve the return of the 15 ton monument. At present the memorial to the Victims of the Gulag stands near the empty original plinth. Dzerzhinsky himself was twice sent to Siberia during Czarist days, a reminder of a more recent deportee, the oligarch who developed the Siberian oilfields, Mikhail Khodorovsky, whose ordeal evolved from an economic and political opposition to a simple defense of his human rights. Sent to Siberia near Chita (where our train is scheduled to stop briefly on the way to Khabrovsk and Vladivostok) in 2005, Khodorovsky was finally pardoned by President Putin and released last December. He is now based in Switzerland. On the train, regular briefings/talks/debates are scheduled, as well as the 2-part BBC documentary “Putin, Russia and the West” also providing a background to the Khodorovsky confrontation. Other topics will include a discussion on Stalin and a film on Genghis Khan. We will be fully invo lved with the different regions every day and will hardly have time to access the comprehensive and relevant DVD library on board. For now, champagne awaits us in the Imperial Waiting Room of the station, our enthusiastic young train attendants are introduced, a band plays and we board the elegant blue coaches of the Trans-Siberian Express. There are fifteen carriages: accommodation for our 50 passengers, two restaurant cars, a bar lounge with live music, a kitchen car, a staff car and a generator. Each guest compartment includes private toilet and shower facilities. Secure safe-deposit boxes are a standard feature. The attendants take turns to be on duty 24 hours. Ready to begin our classic journey of over 10,600 kms, the train moves out, towards Tatarstan and its capital Kazan tomorrow.